The SBA All-Stars played in the Haarlem Basketball Week Tournament in Holland this past holiday season. 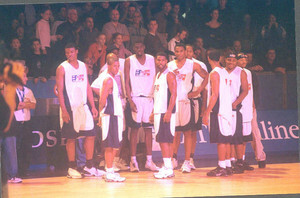 This international tournament, in its 20th year, had professional teams from Holland, Belgium, Brazil, and the U.S. The SBA All-Stars had a chance to prove once again that they can play their style of basketball and can compete at any professional level. The SBA All-Stars played against the USBL Prime Time Sports All-Stars in an All-American game played across the Atlantic Ocean. The SBA All-Stars demonstrated a combination of explosive up-tempo basketball with poised discipline half-court execution defeating the USBL All-stars 76-61. The SBA was led by Lou "The Smooth" White and Victor "Sky" Page with consistent play from the two swing players. "We are proud to show the European professional teams that the SBA is a legitimate force in any type of competition. To soundly defeat a team of All-Stars from another U.S. league which has been around for over 25 years shows us that our players have the ability to perform at a very high level." stated Matthew Rosner, SBA Director of Basketball. The fans at the Haarlem Basketball Week were treated to some exciting SBA highlights. In one stretch of the game the SBA All-Stars went on a 12 -2 run bringing the crowd to their feet and in awe, witnessing alley-oups to Hugh "Baby Shaq" Jones, slight of hand ball-handling, no look behind the back/neck passes, and 3-point shooting by Earl "Pep" Tyson (Harlem World), and the fans were treated to their introduction to the speed and flash of Larry "The Bone Collector" Williams (MVP of the EBC Rucker Park 2002). In addition, Zach Marbury and Gary "2-2" Johnson provided depth at the guard position constantly pressuring the USBL top players James "Speedy" Williams and Raphael Edwards. Dominating in the paint, the SBA was led by Samuel Haley, Skip Youngblood, and Mohamed Woni who provided tremendous leadership, sound interior offensive/defensive rebounding, and scoring. The SBA now looks to continue their success participating in future international competitions and exhibitions as well as market SBA players to leagues and teams throughout the U.S. and the world. 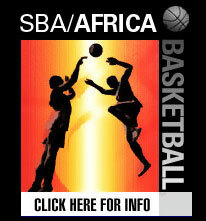 For more information please visit the SBA website at www.streetbasketballassociation.net or contact the SBA Corporate Office at (301) 218-1048.